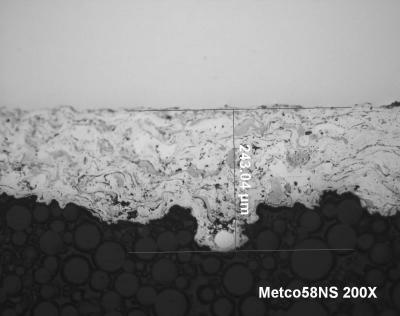 We have spray the METCO 58NS,the microstructure drawing is in the attachment, why we can cause coating thickness fluctuation, big unmelt particles and turbulence still exist, can you give me some advise? Note images shown are reduced in size, please click on them to see full size images. Also indicated magnifications probably will not be relevant to these images and only indicates original viewing magnification. Chy0495, could try to give us more information on how the coatings were produced and the problems you are experiencing? yes ,thanks Gordon to help me put my pic here. Metco 58NS is a Copper-Nickel-Indium Alloy Powder which produces very dense coatings with low porosity and low oxide content. They resist wear by fretting. Can you give me some advise about adjust the parameter? 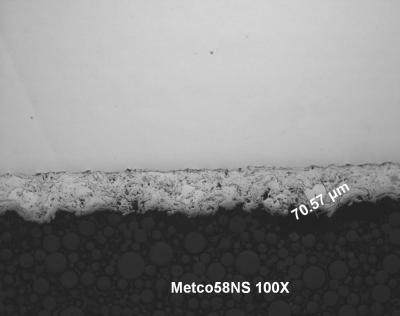 To some extent this is normal and is what causes your coating texture/roughness. 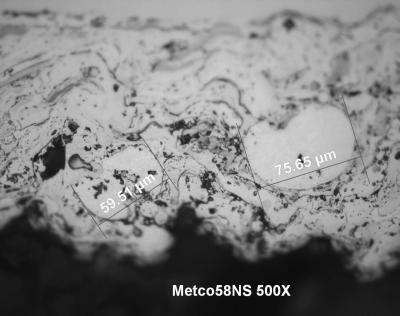 In some of your photomicrographs this does seem to be on the coarse side. 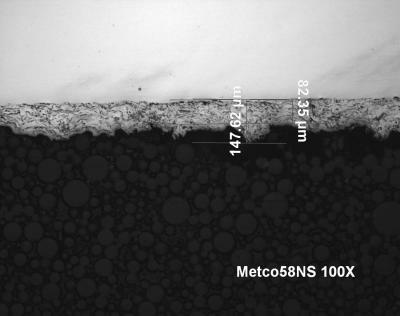 The coating roughness/micro thickness fluctuation particularly on thin coatings will be made worse by the presence of unmelted particles. 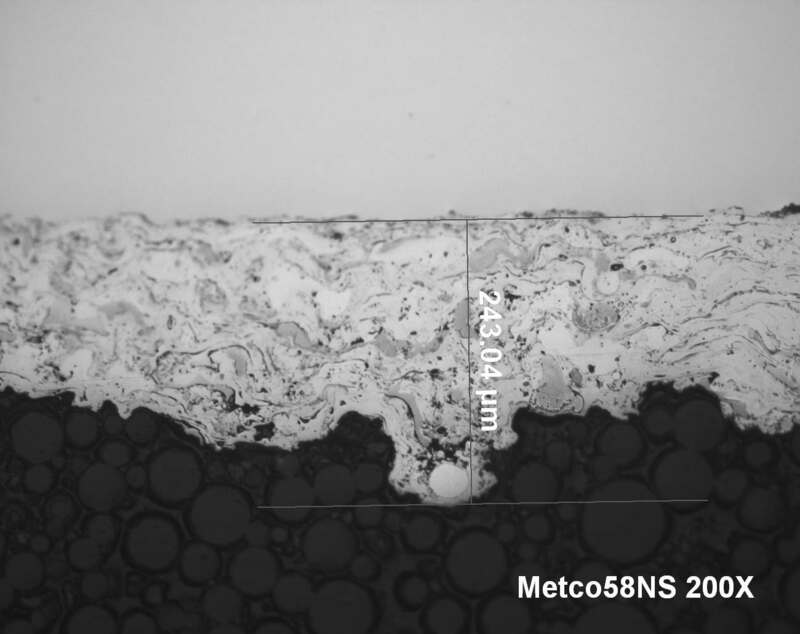 Majority of particles splat out very thinly, so imagine an unmelted/undeformed particle 75 um in diameter sat in a coating averaging 150 um thick! Though, I think your coatings could do with some improvement, we need to be careful with interpretation of some standards. 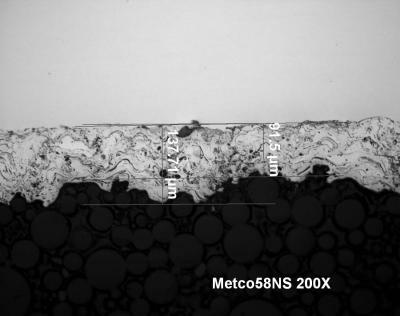 Typically, large globular or undeformed particles are present in certain coatings particularly where coarse fractions of powders are sprayed. 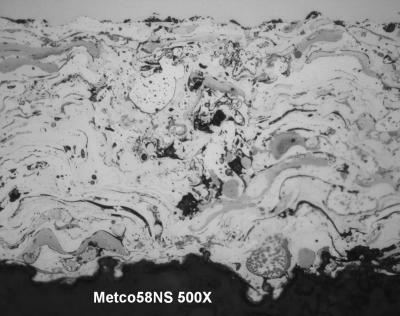 These are normally deemed to be acceptable if they form part of a coherent microstructure and are dispersed throughout the structure. Particles that are associated with areas of massive porosity and/or oxidation and are loosely adhered and not part of a coherent structure are deemed unacceptable. This seems fine, but rather open to differing interpretation from different metallographers. Also seen specificationss which call for undeformed or unmelted particles for your coating to be less than 5% and diameters less than 25 ?m. 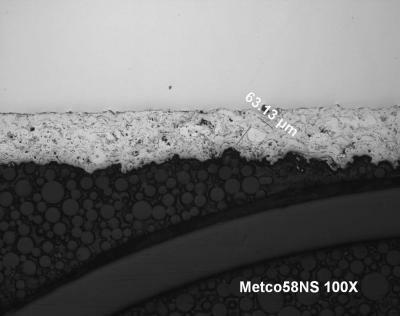 This seems strange as most undeformed or unmelted particles will tend to be much larger than this (nearer 75 um, though these may be viewed as smaller in a 2 dimensional cross-section). Yes, about as clear as mud . Most of your undeformed and unmelted particles appear to form part of a coherent microstructure and are not associated with excessive porosity nor appear loosely adhering. 3.Sorry, I do not understand what you mean by "turbulence still exist". Quote: Can you give me some advise about adjust the parameter? 4. 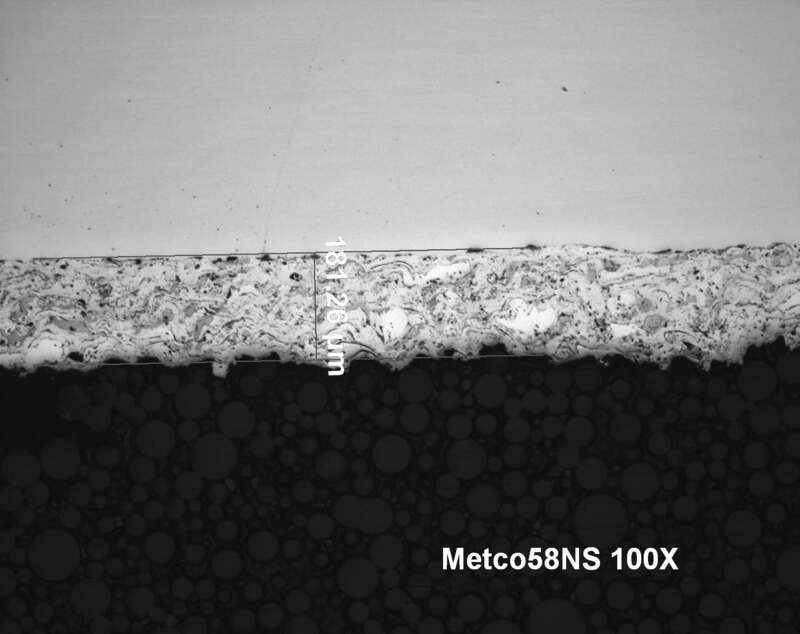 Changing your parameter settings, particularly if you are using recommended or specified parameters for Metco 58NS should really be your last consideration. 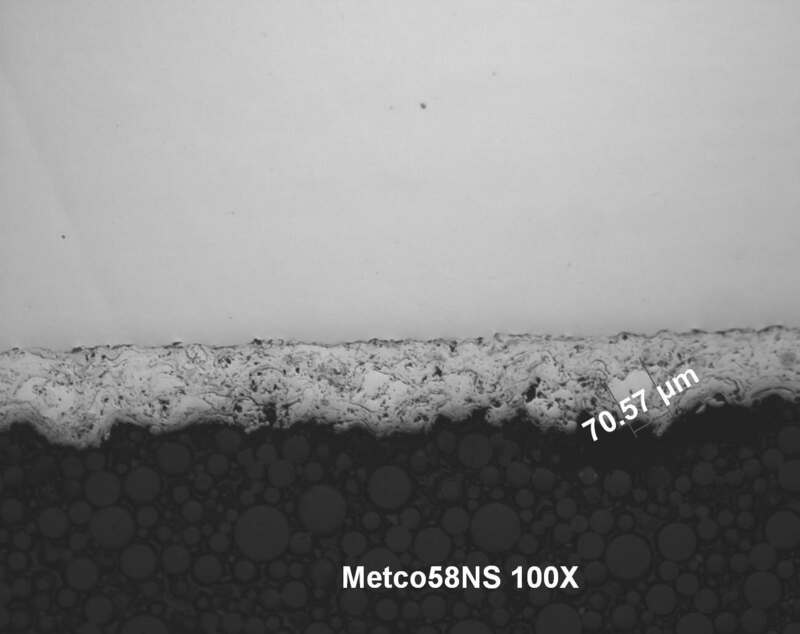 The recommended/specified parameters should give you acceptable coatings. Check first that your equipment is in fact doing what it should, has the system been calibrated and serviced. Check that your powder feed is smooth (not pulsing) and is being injected correctly into the plasma. It is really pointless doing parameter optimisation, unless you are absolutely sure your equipment is in perfect working order first. turbulence is show in the picture 7 from top to bottom. Is that the area of high porosity near the centre of image 11 photo? Certainly not a feature you want to see too much of in your coatings. 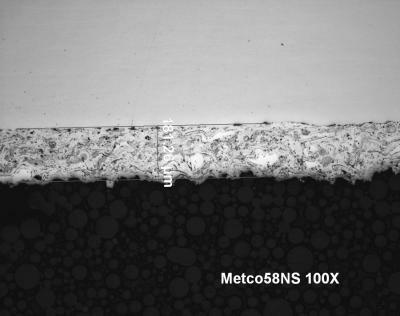 How common is this in your coatings? Difficult to say how or why this has occurred. Sometimes it is useful to take a number of sections at different angles relative to the plasma gun traverse direction. This way you can some times visualise the 3 dimensional structure instead of the thin 2 dimensional structure we normally observe. 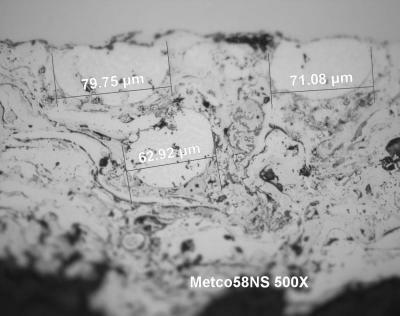 If the section in image 11 was taken at say 90 degrees through the area of porosity (like cutting down into the picture and viewing side on) then we might see something quite different. 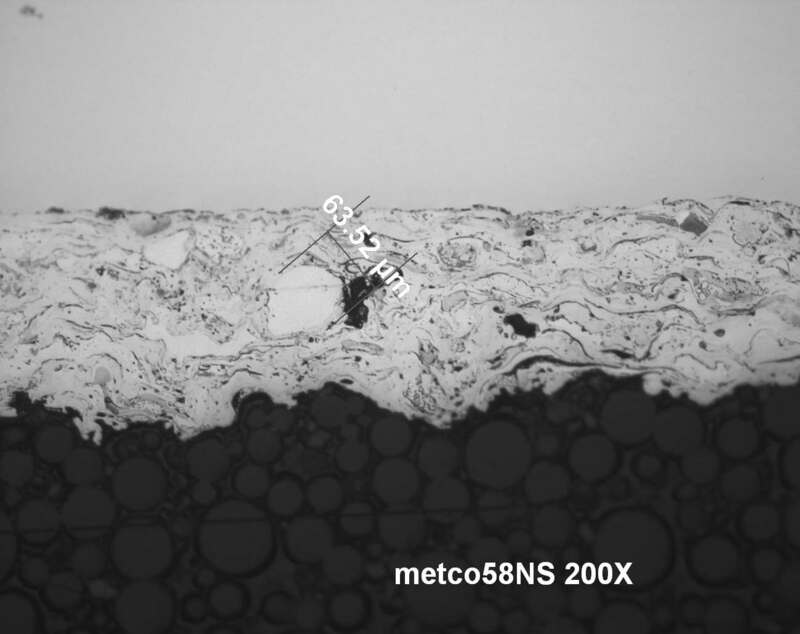 Unfortunately, metallography only shows us a 2D slice of the complex structure of the coating, while really, we should be considering it in 3D. Not to change the subject but what is the hoffman scratch hardness of this coating? I haven't sprayed it in over 20 years (and forgot) and may need to do so. May I know if you are able to provide any techinical info of this coating/powder. My powder supplier cant provide it as I was told that the technical bulletin was not published anymore. Are you seriously telling me that Sulzer Metco can not supply technical data on one of their own products I would ask them again, I'm sure it can't be too much trouble to photocopy an old technical bulletin if they have not got more recent data. Edit: You have a private message. Is your powder nice and dry when you spray? Typically we see coatings like this when the powder is straight off the shelf and cold/moist. What does the flame look like when spraying? Did you have any luck with your problem? I have a few parameters for this spraying this material but, they are for the 3mb/9mb gun with a 7mc II console.The gasses are Nitrogen/Hydrogen. Let me know if this info will help you. If you want to give me your email address I can send over the SM tech bulletin on 58NS. It is SM 10-068. Issued Oct 2000 and supersedes Sept 1984. I am new to this forum here. 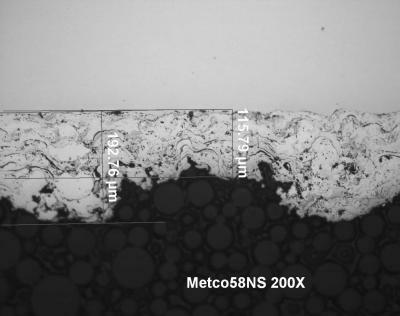 Facing the same situation as chy0495, I also have big unmelted or globular particles (aboout 50microns size) found in my Metco 58NS coatings after metallographic examination. And I also need to adhere to the unmelt limits of Less than 5% Dia and distributed. 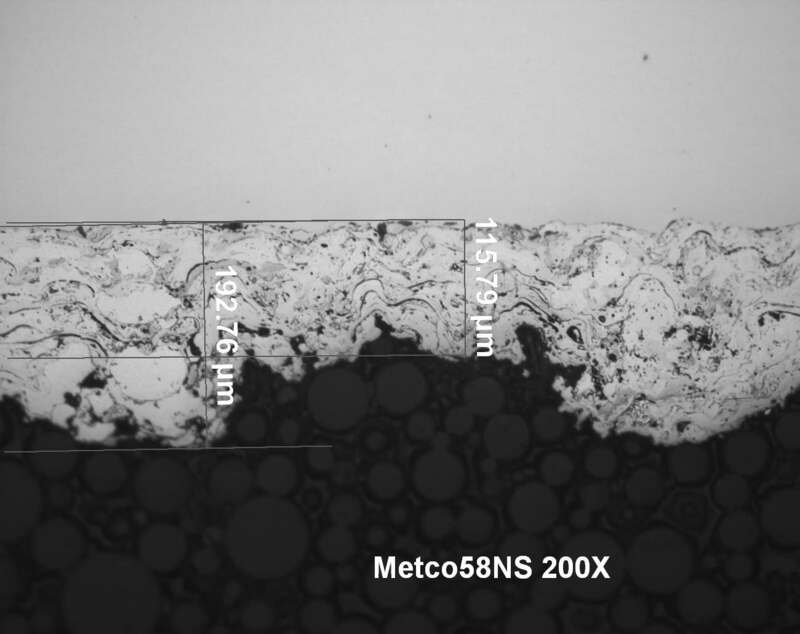 less than 25 micrometers. Am currently using the F4MB gun. Have changed my gun nozzles hardwares but we are still facing the same issue. Does this attribute mostly to powder feeding issues?